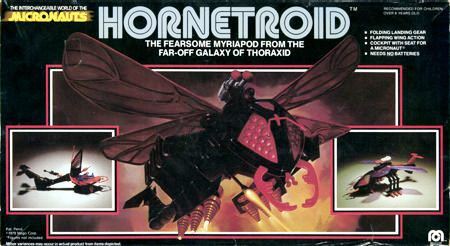 It would be a tough call to select my favorite Mego Micronauts toy from the 1970s, but leading the pack would be 1979’s Hornetroid, “the fearsome Myriapod from the far-off galaxy of Thoraxia.” The baddest MF in the Microverse, the Hornetroid is an interchangeable aerial attack ship that resembles a giant, malevolent insect. The Hornetroid features a front cockpit which opens to house Micronaut action figures, gripping mandibles, four translucent purple wings, a cockpit canopy that resembles compound eyes, laser cannons and more. The Hornetroid’s wings, for instance, could flap up-and-down by pressing a tab on the ship’s dorsal spine. Released at the same time as the “Terraphant” (a terrestrial vehicle resembling a monster elephant…) and personalities such as Membros (with the glow-in-the-dark brain), Hornetroid also shared an awesome quality with toys such as Milton Bradley’s Star Bird and Mattel’s Space: 1999 Eagle One. In particular, the Hornetroid could come apart, and re-form into a scout mode by joining the aft and fore compartments and discarding the middle module. Mego’s Hornetroid was perhaps my most desired toy of 1979 because it looked so damn scary and cool. I still own the one my Granny bought for me that year, but it is in really, really bad shape after three-and-a-half decades. The back dorsal wing/spine is snapped off, along with one of the front compartment’s antennae. I’ve also managed to lose the weird transparent purple “bomb” to the ship. I had it just a few years ago, but now it is gone. The Hornetroid, though not the right scale, also appeared in the popular Micronauts comic-book series from Marvel.